Back in Portland... Gravy, Food Carts,The Farm Cafe and The Observatory. 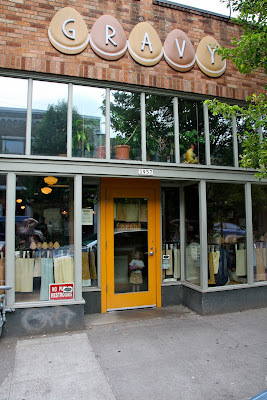 Last weekend was filled with lots of walking and eating in Portland. Of course, you know I can't eat good food without taking a photo of it first! Gravy on Mississippi is my favorite breakfast place in Portland so far. This is my second time there and everything I have tried has been amazing. The menu is great for vegetarians and meat eaters alike. Oatmeal Berry Brulee- This will forever haunt my dreams. It was fresh mixed berries on the bottom, creamy (quite possibly buttery) oatmeal in the middle and, on top, a brulee layer all baked under the broiler I'm assuming. You can also get it with banana or apple instead of berries. Vegetarian biscuits and gravy. This is the single side order... whew! My friend Thaona ordered the breakfast sandwich. Also shockingly big. Gravy uses such delicious bread for everything. Portland is known for its food carts. I can't count how many times I said "another food cart parking lot!!". Entire parking lots in several nieghborhoods are filled with unique spots to grab food on the go. The is way beyond your average taco wagon or falafel stand. We're talking Indian, Ethiopian, Himalan, Thai, wacky grilled cheeses, even waffles. There is an entire website dedicated to the offerings of these tasty shacks called Food Carts Portland. A lot of these spots are only open during the weekdays but we had lunch at the Saturday Market where there were many many to choose from. I decided on Horn of Africa and got the vegetarian platter with Bideena (sponge bread) Missira Dima (red lentils) Kurunba (vegetable in a curry cream sauce) a sambusa (fried vegetable pocket) and a bajiya (garbanzo bean and spice cake). I loved the lentils and the the bread but the rest wasn't as flavorful as most of the african food I have had. I want to do a food cart bike trip through Portland... map out some spots that can't be missed and make a day out of it sometime during the week. I have been meaning to try Farm for a long time and I finally made it there on our last night in town. Farm serves local organic farm to table creations in their stunning peaceful location that leaves you feeling like you are in a remote (but extremely well decorated) country farm house. We were lucky enough to snag a spot on the patio surrounded by fresh herbs. Our table was conveiniently located next to the fragrant mint plants. We started with two beautiful cheese appetizers. The baked Brie and the Farmhouse Cheeseball. I ordered the Seitan Tamale with chipotle creme fraiche. Spicy but refreshing with a perfect mix of textures. The Don ordered their Farmhouse Veggie Burger made with eggplant, breadcrumbs, cheese and spices. The fries came with a homemade ketchup that made me declare that I would learn how to make my own at home next weekend. The sandwich was so rich a creamy from the eggplant. Such a great idea for the "meat" of the burger patty. Thaona ordered the Grilled Corn and Smoky Blue Risotto with Rogue Valley smoked blue cheese. The strong cheese flavor melted into the Risotto and cooked heirloom cherry tomatoes were an incredible combination of powerful flavors so well evened out by corn and Arborio rice. Sunday morning started with a stunning drive along the Columbia and through several small towns outside of Portland. My favorite stop was a lavender farm right off the road in front of a sweet old woman's home. She told us that each weekend during this season she gets up and gather bunches of lavendar and sits amongst the lavander with her dog and cat selling to passers by. We took her last bundle so this appears to be a popular stop. 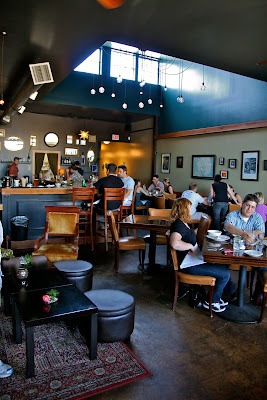 Final stop before heading back to Seattle was happy hour at The Observatory in the Montavilla neighborhood. Don had been here and loved it so he was excited to finally get to show it to me. 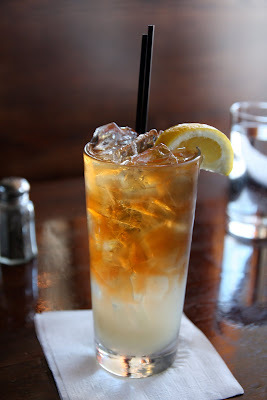 We ordered the bartender's drink special which was a mixture of iced tea, lemonade and vodka. Perfect for the hot day and the mix was just right. We ordered the Oregano Fry Bread to start. Doughy goodness with unique dipping options. I feel like most places would have provided some sort of safe marinara go-to. Not here folks; this came with a basil creme fraiche and a tomato puree. The Old House Dahlia Salad was filled with a fresh mix of shaved dahlia tubers, fennel, pears, citrus and spicy greens with a cranberry vinaigrette and candied nuts. Don ordered the Draper Valley Farms chicken fried steak and kindly handed over a large portion of his sides which included sweet potato mashers and a zucchini squash mixture. My taste buds told me we were on a southern farm but I kept looking out the window at an adorable and vibrant street in southest Portland. I had to snap a shot of the bartender Adam. What great style! This to me was truly Portland. 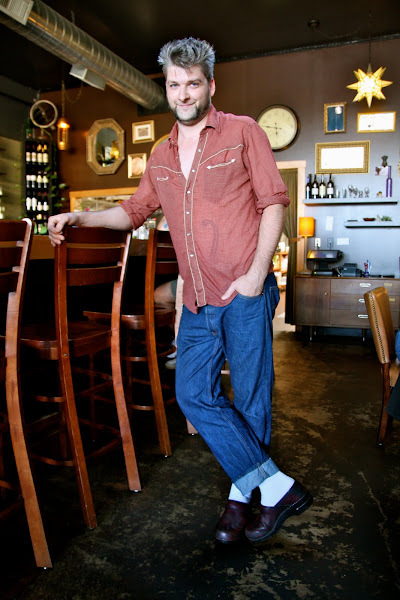 I was caught off guard and pleasantly surprised by how he so effortlessly pulled off clogs by pairing them with a vintage shirt and well worn denim cuffed just right. I know this was supposed to be a food post but I wasn't leaving The Observatory without a photo of this handsome barkeep. More Portland street style to come! It's My Darlin' On the Radio!